As part of GO Expansion on the Milton Line, we’re modernizing Cooksville GO, including a new parking garage with direct access to platforms and eight new bus bays. Once it’s done, the all-new Cooksville GO will offer a whole new GO experience for you. Building a better station is all about you; Cooksville will provide station easier access and more connected transit, all in the heart of Mississauga. 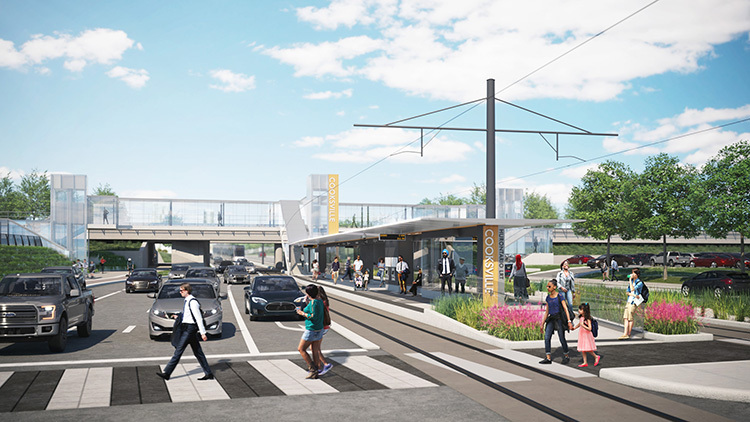 The transformed station will allow you to enjoy more amenities in a brand new station building, more parking with a pedestrian bridge to the platform and better connections to GO Transit and MiWay. Your new station will also include connections to the future Hurontario LRT line, which we anticipate launching by the end of 2022. Walk, cycle or park your car at the station for easy access to everywhere you need to GO. We are creating an easy transit experience for you, by bringing together all of the options you need. This is your integrated transit hub and public plaza. This is your entry to a regional transit network. With connections to the Milton train line, local transit and future Hurontario LRT, this community hub will be your new base as you hop across Peel, Halton, and Toronto. By building more and better access points into the station we’re creating a dynamic, compact, walkable mixed-use transit hub. For additional information on customer impacts, please click here to visit GOTransit.com. We marked an exciting milestone in Cooksville GO Station's transformation. It took a specially built crane for your new bridge to be lifted in place, connecting the new six-storey parking garage to the train platform.